What Can I do to Prevent Swimmer's Itch? Swimmer's Itch occurs as an allergic reaction to a parasite called a cercaria when it burrows into the skin. It wasn’t until 1928 that a Dr. William W. Cort (Johns Hopkins), working at the University of Michigan Biological Station on Douglas Lake in northern Michigan discovered small, water-borne parasites cause swimmer’s itch. 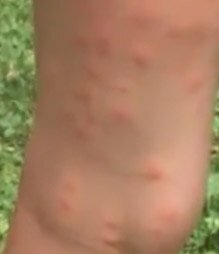 The scientific world took notice and soon investigations around the world focused on the larval parasites that cause the condition known medically as cercarial dermatitis. Over 100 species of parasites responsible for swimmer’s itch have been identified to date as documented as hundreds of scientific papers worldwide. In the 1980's several lake associations in Leelanau County contracted with a professor from Hope College (Harvey Blankespoor) and his associate, Ron Reimink, to determine the cause of swimmer's itch and devise a program to eliminate or reduce the factors that cause the problem. They formed a firm called SICON and quickly became leaders in researching, understanding and controlling swimmer's itch. Although it was known most species of waterfowl carry itch-causing parasites, SICON scientists made a major discovery in the early 1980’s that the species found in common mergansers (a diving duck) is responsible for mayor outbreaks of swimmer’s itch on large recreational lakes in Michigan and across the United States. That discovery opened up new, more effective and less environmentally damaging control methods that continue to evolve and develop today. Today, MISIP is assisting lake associations to understand how to identify and assess the problem on their lakes, helping to connect them with qualified researchers and control experts, promoting new research efforts which will result in long term, affordable methods to maintain low levels of swimmer's itch, assisting efforts to find new methods of prevention and hosting meetings and conferences to share information.